The Seger Replacement Crew arrived at North Pickenham at the beginning of July. After a little in-house training they were assigned to the 856th BS. We don't know who they replaced, nor their crew designation number. According to our initial figures, the Seger Crew flew two missions and one undetermined one. We aren't sure who flew on each of these missions. They did suffer one casualty on the second mission. It was a mission to support the Allied ground forces advancing in France near Toarns. The ship became severely crippled. Our assumption is it was by flak. They were able to reach the Allied controlled beachhead before bailing out. However, S/Sgt Craig's chute failed to open. Lt Todaro was wounded, but we don't know if that was before or after the bail-out. The Seger Crew survivors got some time off, customarily given to downed crewmen that were able to return. 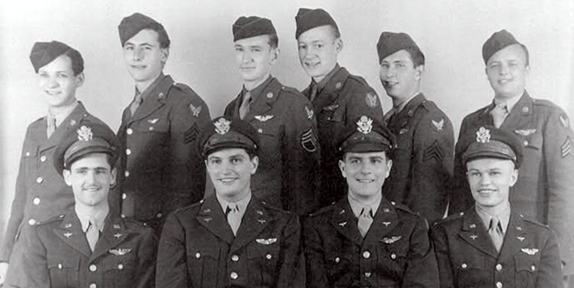 They came close to flying another mission with the 492nd, but the Group was disbanded. They were transferred to the 801st/492nd BG without a bombardier.